I love crunch and these bliss balls /protein ‘power’ balls have lots of crunch as they have toasted shredded coconut and slivered almonds. 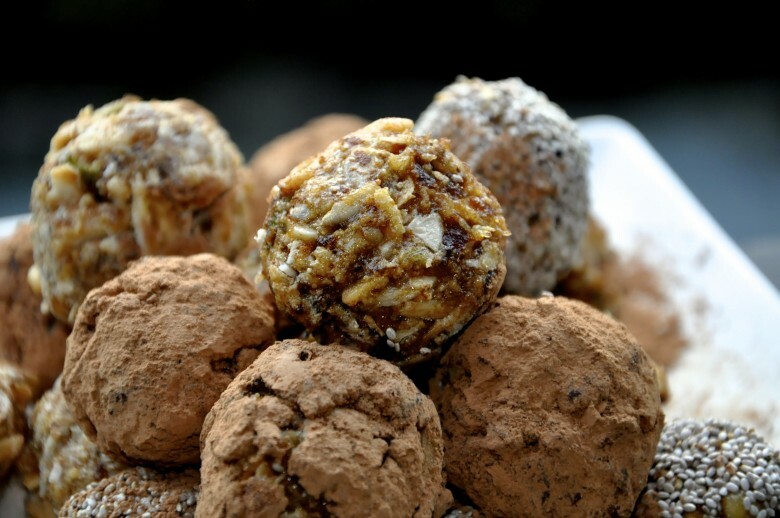 You can make so many varieties of these bliss balls depending on what you have in the cupboard. This recipe originated from my fabulous PT, Meredith from Mana Energy. Blitz the dates in a food processor. You might need a few drops of water. Tip it out into a large bowl. Mix the rest of the ingredients until it is a consistency you can roll into balls. If it’s too wet add a bit more protein powder, if it’s too dry a few drops of water or oil will help. Rolls into balls. You can leave them plain or you can roll them in a bit of cocoa powder, chia seeds or dessicated coconut. I like to keep mine in the freezer as it makes them a bit harder, but fridge is fine. The coconut oil helps them to set harder. Experiment and let me know if you come up with a great alternative. If I’m feel decadent some chopped dark chocolate mixed in is super yummy.